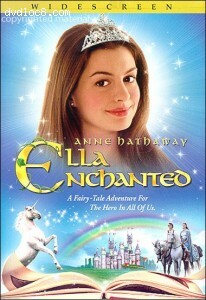 This page contains easter eggs for the disc Ella Enchanted (Widescreen) (DVD, Region 1). From the Main Menu access the 'Special Features' option and select the 'Prince Charmont's Fan Club' option. On the next page, use the arrow keys on your remote control to highlight the "Prince's face" in the heart between the 'Exit' and 'Play' options. Press ENTER to select his face. This will reveal a brief featurette on the different faces that were hidden in the image throughout the film.